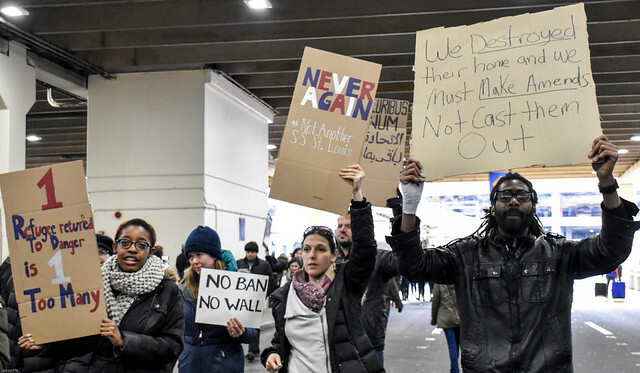 Airport resistance is the biggest step forward by the U.S. public in years. Why do I say that? Because this is unfunded, largely unpartisan activism that is largely selfless, largely focused on helping unknown strangers, driven by compassion and love, not political ideology, greed, or vengeance, and in line with activism around the globe. It’s also targeted at the location of the harm, directly resisting the injustice, and achieving immediate partial successes, including very meaningful successes for certain individuals. It’s gaining support from people never before engaged in any activism. And it shows no signs of any significant undesirable side-effects. This is a movement to be built on, and I have an idea what a next step should be.